The search stops here. That’s what we’re hearing from folks who’ve spent the better portion of their lives seeking a tender, buttery, quick drop biscuit recipe. And is it just us, or did we detect a measure of skillet snobbery in the above note from the otherwise kind folks at Lodge? We’re no strangers to the charms of those blackened and wizened skillets, thank you. But the part about how this recipe works only with one sort of precious metal seems a little presumptuous. While we find there’s no substitute for a cast-iron skillet when there’s a rib eye to be seared, when it comes to these biscuits, we found that you can get by just dandy by dropping blobs of this batter on a baking sheet. 1. Preheat the oven to 450°F (232°C) and lightly butter one large or two smallish cast-iron skillets or a single baking sheet. 2. Whisk or stir together the dry ingredients, smashing any lumps. Cut in the butter with a pastry blender or fork until the mixture resembles coarse crumbs. Add the buttermilk and gently toss the liquid and dry ingredients with the fork just until everything is blended and a soft, sticky, blobbish dough forms. 3. Drop blobs of the dough onto the prepared pan, spacing them about an inch or two apart. Bake until browned on top, about 20 minutes. Let cool slightly. Chances are you’ll need to swat hands away. These insanely good little beauties were so easy to make. I was able to whip them up while knocking back some Champagne, chatting with guests, and generally being a bon vivant at an early Easter lunch for friends. I have a 12-inch cast-iron skillet, so I simply dropped eight blobs of dough in concentric circles and slid the whole shebang in the oven. I’m not exaggerating (you know I’m prone to a little hyperbole every now and then) when I say that people thought these were the best part of the meal. Damn them! All that work on a ham and the biscuits were the stars. The reason the recipe makes seven biscuits is because the Lodge biscuit pan has seven “rounds”, which is an odd number for a recipe. I actually own the biscuit pan, so I made the drop biscuits in the pan and on a baking sheet. If you use the Lodge pan, I would recommend pre-heating the pan in the oven, instead of dropping the dough into a cold pan. Otherwise, the bottoms of your biscuits won’t be golden brown. We preferred the biscuits baked on the baking sheet, as you end up with more crispy, craggly edges and the entire biscuit is golden brown. As for the biscuit itself, it’s light, moist, fluffy, and tender. It’s a good biscuit for butter and jam, shortcakes, or a good helping of sausage gravy. I found that to make seven biscuits, each one used a little more than one quarter cup of dough. My husband loved these biscuits, and he claims he will only eat the ones that come from a certain fast food fried chicken and biscuit joint. They are light and buttery and quite addictive. I dropped these biscuits on a silicone-mat-lined baking sheet instead of using the biscuit pan. I found they spread quite a bit, so if you’re going to drop instead of plop in a pan, making more than seven might be a better idea. These biscuits don’t have staying power, so eat them the day they are made. Not that they will last that long anyway. These biscuits couldn’t have been easier to make. The simple ingredients are quick to stir together and pop in the oven. I’ve had a Lodge biscuit pan for many years and I loved seeing another recipe to give me an excuse to use it. The biscuits had a nice tangy flavor from the buttermilk and were fluffy inside while having that lovely crunchy crust on top. These would be perfect either for biscuits and gravy (along with some bacon) for breakfast, or with stew or chili at an evening meal. These biscuits looked so simple I thought they couldn’t possibly taste that great. Wow, was I wrong. The biscuits are crisp on the outside, light and fluffy on the inside. They are lightly sweet but still have great flavor. The recipe works exactly as written without rolling or kneading of any kind. They taste great without any accompaniment, but add some butter and honey and they become heavenly. They are quite delicious, and I am pretty sure I could make a meal of just these biscuits. This basic, but tasty, biscuit recipe was easy as could be. Quick mixing, no rolling. Very unfussy. I didn’t have a special biscuit pan so I just dropped the biscuit dough onto a heavy parchment-lined sheet pan, my baking tray of choice for biscuits. This made larger biscuits (if you make only the seven indicated) than I like so when I did a second batch, adding cheese and chopped chives to some, grated orange, toasted pecans, and dried cherries to the rest, I made them smaller and got 10. The smaller biscuits needed only 13 to 14 minutes to bake. All the biscuits were delicious, nicely browned, and light and tender. Wow, these are light, fluffy, and melt-in-your-mouth good. We had breakfast a few nights ago for dinner, and this was just the thing that was needed. I love formed biscuits rather than drop, so I rolled the dough out, being careful not to overwork the dough, and floured it lightly. I put the biscuits in an iron skillet with the bottom and sides coated with the shortening. They turned out so crispy. They were requested the following morning from my youngest granddaughter, who wanted it sliced open and topped with scrambled eggs. I can hardly wait to make these again. One tiny criticism from the hubby is that he felt they needed more salt. But by the time we put some butter on them, we were happy. I wasn’t sure this would be a hit here, since we don’t care for sugar in our biscuits, but these were great. I didn’t tell hubby and son about the small amount of sugar until they had taken a couple bites and proclaimed them a winner. They were really surprised, but said I could make these again. I can see where the Lodge Drop Biscuit pan would come in handy to keep them from spreading together, but don’t let that stop you from making these lovely biscuits. I didn’t have one, so I used a large cast-iron skillet to drop the biscuits in instead. They did run together while baking, but that didn’t cause that much of a problem. All I had to do was run a knife through where I could see each biscuit was and they popped right out. I like the ease of stirring the ingredients together and dropping them from a spoon into the pan. I mixed the butter in with my hands like I do with scones, to get the preferred crumbly results. 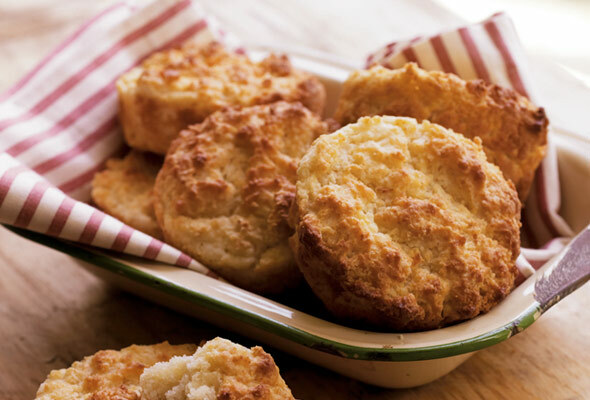 A joy to throw together, this drop biscuit recipe is an easy do. I didn’t have a Lodge cast-iron drop biscuit pan, so I used a regular cookie sheet. One thing I did wrong is that I made the biscuits and sat the cookie sheet on the stove while some oven fried chicken wings cooked and the biscuits sort of spread, so this may have been my fault. Actually the biscuits were soft and as my mate said, “fluffy.” They were delicious with the chicken wings and with liberal amounts of butter and honey, even though they were a little flat. I made this recipe in my much-loved cast-iron skillet and it produced a tender biscuit that I popped in my mouth, steaming from the oven. While I usually steer clear of drop biscuits (since childhood days of Bisquick “drop” biscuits), this recipe has changed my mind. It came together quickly and took a bit longer than the 20 minutes in my oven, but well worth the wait. A nice tender crumb that would make any grandmother proud. Pretty delicious. An easy biscuit recipe that doesn’t need a special pan. Just butter a sheet pan really well. Serve with jam or other preserves or honey. Fluffy and satisfying! “Memories of Gramma” is what these biscuits brought back for me. Light, buttery and utterly delightful. They are easy to put together and are easy to bake. They taste like “more” as my dinner guests said. I used my large cast-iron pan to make these and they came out great—light and fluffy with a crispy crust on the bottom. I can’t imagine how big the biscuits are that they made, but my batch made about 16 good-sized biscuits. Even the one or two left over were great the next morning for breakfast. I will certainly make these again and again and again. This recipe is it. The position has been filled. Thank you. No need to flour your countertop, get out your rolling pin, or buy a special biscuit pan (read on), these delicious biscuits are a perfect spur-of-the-moment accompaniment to salads, soups, scrambled eggs, etc. After mixing the dough with my pastry cutter (a breeze), I grabbed a handful of the dough and dropped it in the middle of my seasoned 12-inch cast-iron skillet. Six more handfuls followed surrounding the first dollop. Voilà—beautiful round biscuits in no time at all. It’s OK if the portions touch each other, as the biscuits pull apart easily. These biscuits were so amazing that I’m wondering if maybe I have some Southern blood in me. (Not likely for someone of Fillipino-Irish descent.) I have always loved biscuits, but never had great luck making them. They’re usually dense, flat hockey pucks. This biscuit recipe took away all of the previous apprehension I had in attempting to make biscuits. The tops and bottoms are buttery and crunchy, while the insides are soft and almost cloud-like. They are very fast to put together and will certainly be on my table again very soon. It’s no exaggeration when I say that these were the BEST biscuits I have ever eaten. My family has been trying to re-create my great-grandmother’s buttermilk biscuit recipe for years and these were just as good as I remember hers being. The biscuits had a nice buttery crust, and the inside was super fluffy and moist. They puffed up very high, which made you want to eat all seven biscuits yourself! We served them with a choice of jams and jellies, which made for a nice presentation as well. I ended up using buttered muffin cups instead of a drop biscuit pan, which was an ingenious suggestion. I used very cold butter as opposed to margarine or shortening. The cooking time was right on, and the recipe did make exactly seven dreamy biscuits! I don’t save many recipes to make more than once, but this one will become a breakfast staple. If you're looking for a quick, amazingly simple, yet delicious biscuit, look no further. You can get these into the oven in record time, and in 20 minutes you'll have fluffy, buttery biscuits. Just warn your family (read: husband) that they're HOT (duh?!) before they burn their fingers eating them hot off the pan. 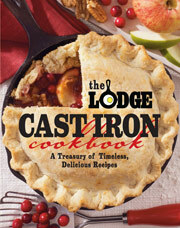 Buttermilk Drop Biscuits Recipe © 2012 The Lodge Company. Photo © 2012 Mary Britton Senseney. All rights reserved. All recipes and photos used with permission of the publisher.